From April until September 2017 the guest studio K22 will be offered to 3 artists or artist groups in exile already living in Berlin. A parallel program with talks, project presentations, video-art screenings and exhibitions will be held during the 6 month long project and will be open to the public audience including the community of the BLO Ateliers. 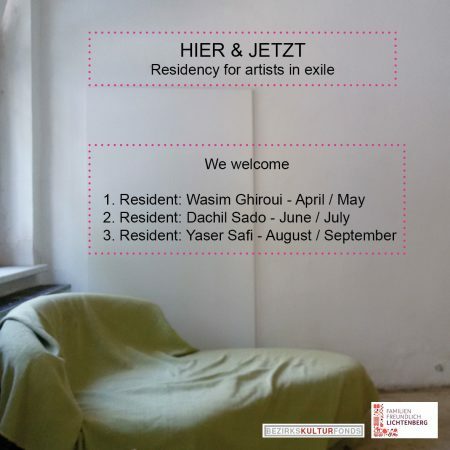 HIER und JETZT artist residency project offers artists in different career stages from various disciplines (writing, painting, sculpture, multimedia and video art, new technologies, installation art, performance, music, dance, etc) a working place for a concentrated period of two months. We support residents in their creative explorations, investigations and artistic growth within an environment of communication and exchange. The studio will be offered to each artist for 2 months. During the residency period we ask for a public presentation of the work. Each artist will have a budget of 500 Euro to cover material costs. The studio rent is covered by Bezirkskulturfond Lichtenberg. At the end of the whole residency project there will be a group show featuring the participating artists at the “After the Butcher” Gallery in Berlin Lichtenberg (planned for October 2017).